Introduced in France in 1919 the Cyclauto was built by the Compagnie Francaise du Cyclauto. Power came from a 487cc water cooled 2-stroke side by side vertical cylinder Sicam engine that was mounted at the front of the vehicle and drove the rear two wheels by a chain to an epicyclic gear on the counter shaft and then two belts running over pulleys to provide the final drive. Later models were powered by 900cc Ruby 4-cyclinder engines. The body of the vehicle was a tubular steel frame used for bicycles with steel panels attached to it. It also had a large collapsable hood. Production ceased in 1923. 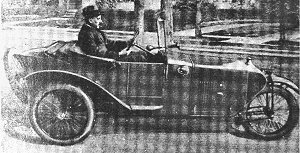 A 1921 Cyclauto. (My thanks to Kerry Croxton for sending in this picture).